‘Our colleagues get scared when we bring out the Post-it notes’. This comment from a recent client sums up the dread that many people feel about the use of ‘creative’ techniques within the workplace. It’s a real shame as moving beyond the traditional flipchart and bullet points approach can free up people’s minds, encourage innovation and vastly improve collaboration and communication. One of my favourite techniques is the use of rich pictures. The clue is in the name. Rich pictures are drawings that are usually made collectively to explore or define a complex problem, situation or system. I first came across them as part of Peter Checkland’s Soft Systems Methodology, which provides a wider framework for entering and improving messy organisational problems. I deliver an annual ‘systems thinking’ workshop to MBA students at Brighton Business School and, without fail, rich pictures form the aspect of the session which students find most useful and applicable to their own work. Rich pictures enable groups to draw out key relationships, emotions and groupings in a way that makes sense to them, as a starting point for further exploration of issues and the generation of potential improvements or actions. They are great for rapidly addressing problems and for generating new ideas and opportunities. Once people get over the initial fear of not being able to draw (it really is not about artistic prowess), they very quickly become absorbed in the creativity of making a picture. Some work very descriptively, others use metaphors or tell visual stories. Whichever way, the results are always memorable and eye-catching, and groups relish explaining them to others. A picture is often genuinely worth a thousand words. I have worked with clients for whom a hand-drawn amateur image of an exasperated nurse or a metaphorical picture of disparate desert islands has done more to shift senior thinking and gain engagement to change than any number of board papers. The images can also be reproduced and shared in newsletters, team meetings and future events. All you need is some paper or a white board and some different coloured pens. That’s it. There is no need for professional cartoonists; rich pictures are about engaging groups to produce a view of the world in their own way. I have found that the process is a great leveller. It is a fantastic way to engage mixed groups and everyone has something to input about their perspective on the situation, regardless of role or status. It’s also a very adaptable approach. Although rich pictures originated as a way to explore the current situation, I’ve found it rewarding to ask people to draw what they hope the future could look like; this can be very empowering and enables you to ask ‘so how do we get from where we are now to where we want to be?’. Unlike some more ‘rational’ problem-solving approaches, such as process mapping, rich pictures enable you to very succinctly map out some of the key relationships and emotions within a given situation. Given that, within complex environments, many of the challenges and potential solutions are people-related, this gives rich pictures an edge and a different perspective. This doesn’t mean that other problem-solving or quality improvement techniques cannot be used to further explore certain aspects of the situation or system; they can be complementary. Drawing out a problem is a great route in and it helps people to collectively engage with the problem. In the end, it is likely that these people will also be the ones you call on to make improvements happen. The act of creating a rich picture requires teamwork. It helps people to communicate, collaborate and creatively express themselves. Even more importantly, it encourages people to better understand others’ points of view, which can immediately help to solve problems. 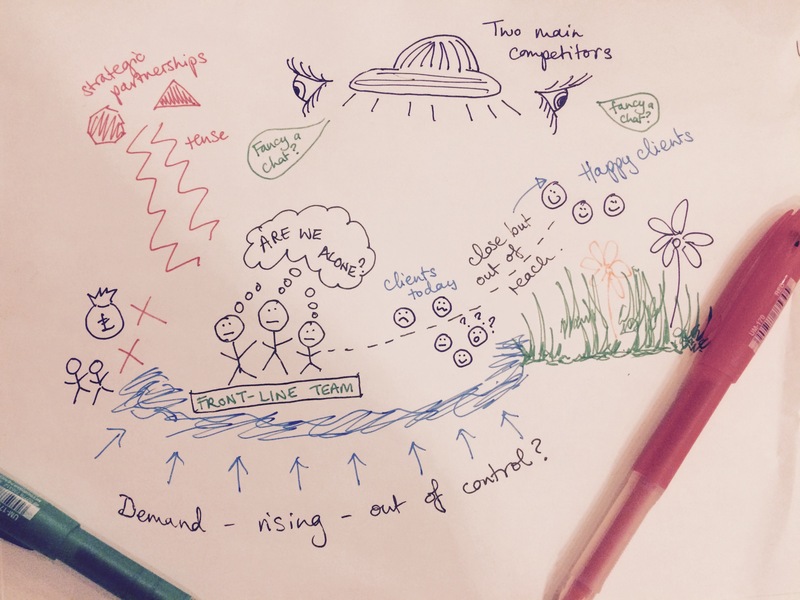 And, as rich pictures are intended to help explore and address real challenges, the activity may feel more relevant, tangible and useful than more general team-building sessions. It will help engage people in potential solutions and improvements. Rich pictures come into their own when the situation or system is messy. There are often many different people, groupings or even organisations within the mix. Emotions, relationships and communications are often challenging and at the root of some of the problems (and solutions). And these situations are usually playing out in complex and changing contexts. Rich pictures enable people to acknowledge the complexity and identify areas of focus for further problem-solving or service improvement without losing sight of the whole and the relationships between different parts of the system under scrutiny. Rich pictures work best when you engage widely and provide careful facilitation, either internally or externally. Who are the key players or what are the key groupings/functions/organisations? What are the main relationships and how do they work? What are the main activities, inputs and outputs/outcomes and how do they happen? Expressing the problem situation is the first step to addressing some of the challenges and I believe that rich pictures offer an initial degree of analysis and engagement that some more traditional techniques lack. Tagged creativity, improv, team, workshops. Bookmark the permalink.